I recently built a Secchi disk (see link for instructions) for water clarity measurements. 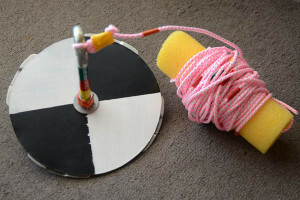 A Secchi disk has four quadrants painted black and white and is 20 cm (freshwater model) in diameter. The disk is lowered into the water using a line marked in feet or meters and the point that the disk disappears from view is called the Secchi depth. Measurements should be taken between 9 am and 3 pm on the shaded side of the boat (to avoid glare off the surface of the water). If you roughly double the reading from the Secchi disk you get a good idea on the extent of light penetration. Generally, plants will only have a enough light to grow at double the Secchi disk measurement (in full sun). The attenuation (or extinction) coefficient can also be obtained (Secchi depth in meters/1.7). I’m taking readings in an attempt to see if I can find patterns correlating water clarity/water colour/water temperature with baits that preformed well that day/trip. I’ll keep a running log below for now. Colour, Fish Science, Lake Science, Lure Choice, Research.